Running Press Adult, 9780762449682, 192pp. 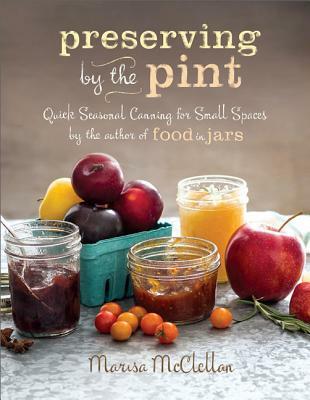 If most canning recipes seem to yield too much for your small kitchen, Preserving by the Pint has smaller--but no less delicious--batches to offer. Author Marisa McClellan discovered that most "vintage" recipes are written to feed a large family, or to use up a farm-size crop, but increasingly, found that smaller batches suited her life better. Working with a quart, a pound, a pint, or a bunch of produce, not a bushel, allows for dabbling in preserving without committing a whole shelf to storing a single type of jam. Marisa McClellan is a full-time writer, teacher, and blogger at Food in Jars (three times nominated by Saveur magazine for a Best Food Blog award, and winner of Best of Philly from Philadelphia Magazine). Her writing appears on The Food Network blog, Saveur.com, and Food52.com. She lives in Philadelphia with her husband. Visit her at foodinjars.com.